My beautiful and very fun-to-drive 2003 Nissan Altima 3.5 SE V6, is about to be sold, probably within a week. 1/21/2010: I cleaned out my garage to make room for the new Volt and for now have been parking my Altima there. Its color is called “Silver Ice Metallic” although in the photos here it almost looks white. I am just too excited about getting my Volt! Still have a bit of work to do cleaning out my garage and getting the ’68 pickup slid over to make room to park the Volt next to it. I don’t intend to leave the Volt out in the weather. Plus I need to obtain and install the 240V charger in my garage. Update 1/14/2011: My garage is cleaned out! I’ll start parking my Altima in it today while waiting for the Volt. Also, the Volt has been in the same status dated 12/28/2010, and today there is a new status. I think it may be at the dealer or soon-to-be there. I’ll check with them Monday. Update 1/22/2011: Removed links to sale information of the Altima because I have a buyer. 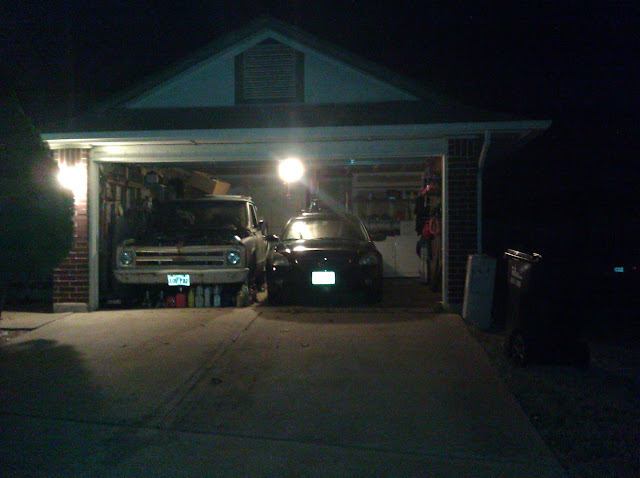 Added photo I took last night of ’68 Chevy pickup moved over and garage cleaned, Altima parked next to it. Update on the Volt: It was travelling through Ohio on Tuesday and was travelling through Arkansas yesterday. So it will be here soon! Update 1/31/2011: The Volt was at the dealer on 1/27/2011 and was ready for me to pick it up the afternoon of 1/28/2011. I have been driving it every day since then and have officially sold the Altima. Photo gallery here. Oct 5 2009: O2 sensor update: It happened again for the first time since Aug 3, 2 months ago. Also it happened on a Monday afternoon right after starting it to go to work. At the time, I hadn’t started my car in over 50 hours. If I remember correctly, the same situation was true on Aug 3. I hope the coming cold weather won’t be exacerbating the problem. By the way, I was previously mistaken about when the inspection is due. I though it was due in September, but that was the registration. I think the inspection will be due in March. Aug 12 2009: My 2003 V6 Nissan Altima seems to have an O2 sensor that is going out. I looked up the OBD2 code in the service manual I have. It told me there is an open to the heater in the O2 sensor. It could be a wire as well, I don’t know yet. If I have to, I’ll troubleshoot it in time to renew the car’s inspection. I just hope I don’t have to replace 2 of them at once, like I’ve heard you’re supposed to do when one has to be replaced. This car has 4 O2 sensors altogether.